NU has made the tournament - what next? It’s a new era. In four short years, Chris Collins has ended the curse, created a new culture and transformed Northwestern University into a basketball school. 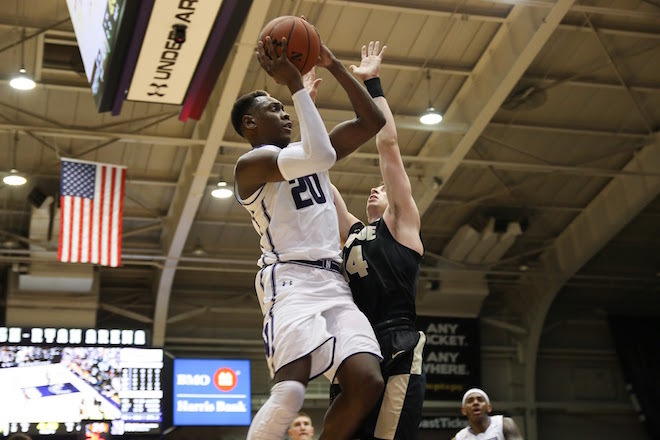 Other than the untimely construction on Welsh-Ryan Arena, nearly everything about the 2017-18 Men’s Basketball team is promising: they come into the year with a dangerous combination of talent, experience and potential. They’re in the national spotlight and were ranked No. 19 in the preseason AP Poll. They have two key players (Aaron Falzon and Rapolas Ivanauskas) returning from injury, and they have an optimistic and energized fan base. A number of players are expected or able to rank among the Big Ten’s best: prominent among them are team captains Scottie Lindsey, Bryant McIntosh, Vic Law and Dererk Pardon. Now that Northwestern has gotten over the hump that plagued them for decades, a pressing question has emerged: what’s next? As we can see from Lindsey, McIntosh, and Collins, there is no longer one definitive answer. 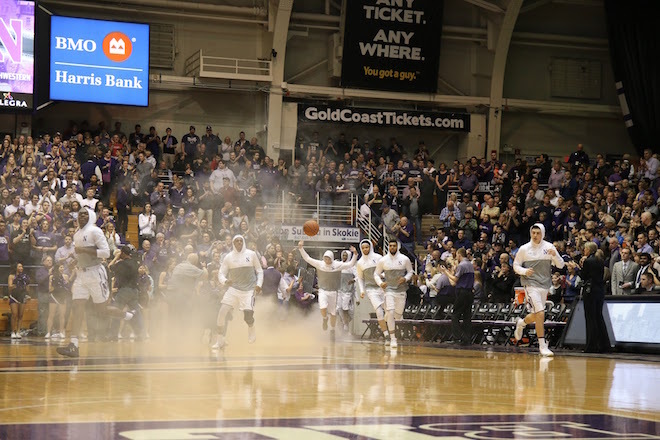 However, common among all their goals is a steady confidence that the team will improve upon last year and demonstrate that Northwestern men’s basketball is here to stay. The team’s purest shooter and an above-average defender, Lindsey has made strides in each of his three seasons, improving from averaging 4.4 to 6.4 to 14.1 points along with boosts in steals, assists, and rebounds. There are not any obvious flaws in his game, but in terms of individual goals, Northwestern hopes Lindsey can make a bigger impact on the defensive side of the ball and improve his consistency. “I think I had a lot of games where I shot the ball well, but there were times when I went through slumps,” Lindsey said of last year. After participating in the Under Armour All-American camp this past summer, Lindsey said he has improved on “ball handling, post work, and using my height.” He hopes that this year he can handle a bigger load offensively while guarding the opponent’s best players on the other end. More importantly, Lindsey expects improvement from the team, even though he understands that high expectations are not always easy to meet. Bryant McIntosh McIntosh plans to use last year’s momentum as a springboard for himself and for the team. Lindsey might expect a lot from the team going forward, but B-Mac’s goals are more ambitious – and definitely bolder. While ending the season ahead of the likes of Duke (ugh), Michigan State and Villanova seems a dubious proposition, the statement reflects McIntosh’s confidence and fiery disposition that makes him the leader of this Northwestern team and that landed him on the All-Big Ten second team in 2016-17. Individually, he has worked to set himself up for improvement in a campaign where he averaged 14.8 points and 5.2 assists. While this team has many important components, once the postseason begins, they will go as far as Bryant McIntosh takes them. Chris Collins The face of this new era and the long-term head coach (he is reportedly signed through 2024-25), Collins is, unlike McIntosh, focused not just on the upcoming season but the program’s future. However, like McIntosh, Collins sees no problems with raising expectations to be as high as possible. “If you don’t think about winning the NCAA Tournament you probably shouldn’t be doing it,” he said when prompted about the possibility. He has even bigger expectations for star redshirt junior Vic Law. While much of the surface pressure is off, Collins knows that this season is paramount to the program’s development and to his legacy. What should the fans expect? Preparing for an NCAA championship seems like a recipe for disappointment, but should Lindsey’s hope of reaching the Sweet 16 be the benchmark for a successful season? Probably not. It is named March Madness for a reason: crazy things happen, and good teams get upset every day. Rather, the Wildcats should definitely improve on last year’s 10-8 Big Ten record – which included 2 ugly losses to Illinois – and perform well in the Big Ten tournament to entrench themselves in the top tier of the conference. Assuming non-conference play goes well, that should land them with 23-25 wins and a five or six seed in the NCAA tournament, keeping Evanston dancing and strengthening the foundation for the future.